When you’re thinking about Groupe PSA and all-wheel-drive, the first thing that springs to mind is the DS7 Crossback. In the premium-oriented SUVs case, all-wheel-drive is exclusive to the plug-in hybrid drivetrain, which features an electric drive unit at the rear to enable all-wheel-drive. The Rifter 4×4, however, benefits from a 4WD manual transmission with a viscous coupling. Coming to the 2018 Geneva Motor Show alongside the all-new 508, the Rifter 4×4 is a concept that was made possible by Dangel. The historic partner of all things Peugeot with 4WD, Dangel makes a case for off-road potential thanks to 4RM and Lock. The first function sends the goodies exclusively to the rear axle, while Lock mode locks the rear axle, aiding in serious off-road scenarios. Compared to the production-spec Rifter, the 4×4 Concept wears BF Goodrich off-road tires and boasts 80 millimeters of additional ground clearance. The most interesting oily bit regarding the one-off adventure van is the choice in drivetrain. Instead of an electrified setup, Peugeot decided on PSA’s 1.5-liter turbo diesel, which prides itself on 130 PS and 300 Nm (221 lb-ft). 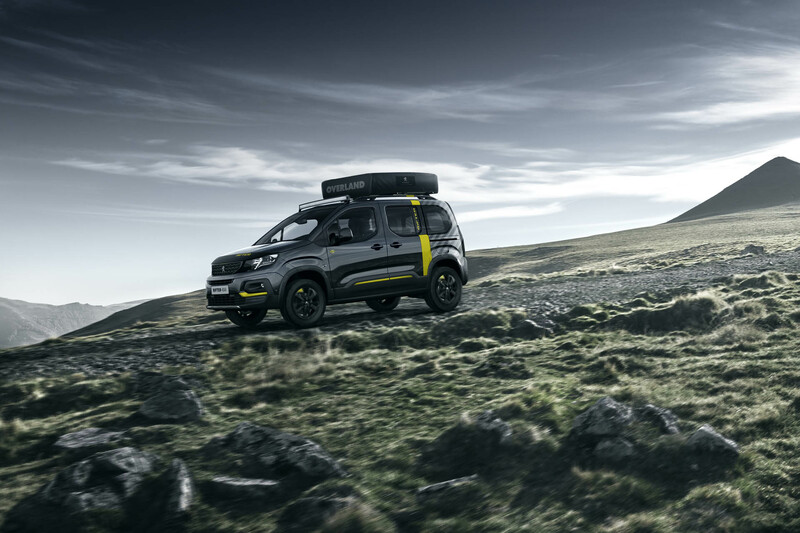 Despite the fact the 4×4 Concept won’t see any off-road action of all, Peugeot is adamant that “even the strongest slopes will not slow you down” thanks to the BlueHDi 130-Dangel 4WD combo. But that’s not everything there is to the Rifter-based 4×4 Concept. The Overland tent from Autohome is a must-have for the adventure-oriented customer. Designed exclusively for this application, the canvas tent is branded Peugeot and features the same graphic theme as the body of the car. The interior, as you might have guessed by now, also mirrors the aesthetic qualities of the exterior. Last, but certainly not least, the Rifter 4×4 Concept is equipped with a bicycle rack at the rear, which is chock-full of the eM02 Powertube. To make a long story short, that’s the latest electric mountain bike developed by Peugeot, whose battery is integrated into the frame.